At the ripe age of 30, I'm delighted to inform you that I am about to take off for my first-ever bachelorette party. The truth is that as a freelancer I don't always have the luxury of being able to embrace every vacation opportunity that comes my way—but this is one I couldn't miss. My dear friend Rachel is getting married here in New York in September, so a group of us girls are off to celebrate her last months of singledom in Palm Springs, California. Though I've been out to California quite a bit since moving out East, I haven't been to Palm Springs since I was a teenager, on a road trip through the Southwest with my parents over spring break. Needless to say I'm really looking forward to experiencing this desert oasis through fresh, adult eyes, especially given what a destination it's become in the last few years thanks to all that mid-century modern eye candy on Instagram. I know it seems a little counter-intuitive for such a sunny, hot place (temps are going to be hovering right around 100 degrees all weekend! 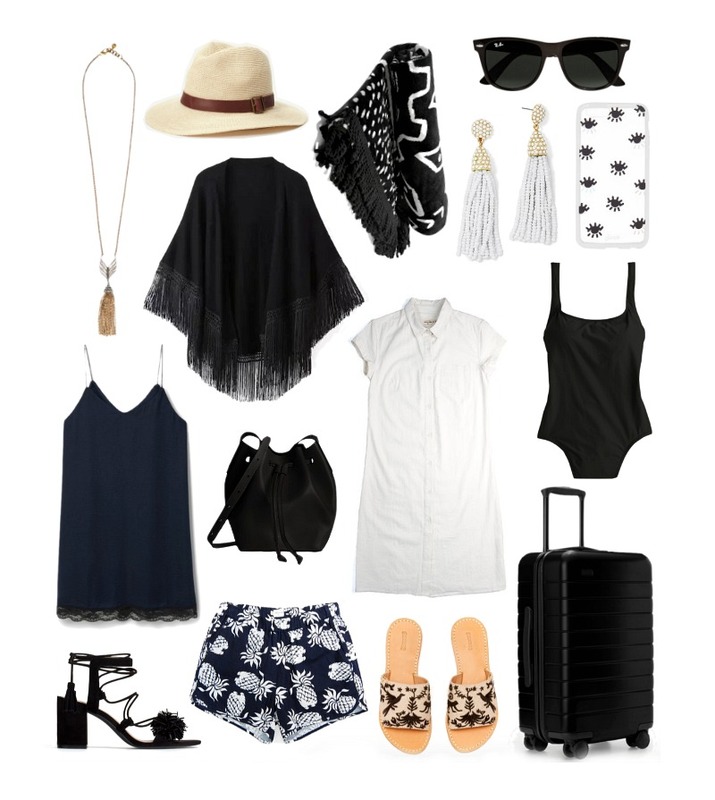 ), but almost everything I've packed is either black, white or navy. I'm particularly excited to bust out my Bridge & Burn pineapple shorts as well as this slinkly little slip dress I found at Mango (on sale for $19) a few months ago. If you're as obsessed with them too, shop more slip dresses right this way. Since it is Palm Springs—I want to make sure I have accessories that are ready to party, so I packed my favorite mini Rachael Ruddick bucket bag and ordered BaubleBar's rather fabulous all-white tassel earrings. (Need more tassel earrings in your life? Me too.) I also invested in a new on-piece swimsuit, the 'Ann Marie' from Solid & Striped (in black, naturally). By the way, if you have any suggestions for can't-miss spots in Palm Springs, leave 'em in the comments or hit me up on Twitter! To keep up with all my bachelorette weekend adventures, be sure to follow along on Instagram. The clothes are so nice and stylish! I think that your outfits are so amazing! This service will help you with the study custom essay writing service reviews. Try to use it! Delhi Escorts Services This is totally interesting one that you heard here.